A review of the innovative garden plan book and videos . . . 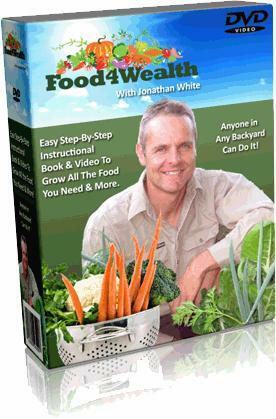 The 'Food4Wealth' system by Jonathan White is a step-by-step guide to starting, maintaining and enjoying a productive organic vegetable garden on a small plot of land. Over 60 minutes of 'how-to' video demonstrating garden tasks such as laying out your garden, building raised bed frames, 'layering' organic material in the frames, building trellises to grow crops 'up, seed starting, composting and more. I went through this package in some detail (being a gardening writer myself ;-) Food4Wealth packs a lot of tips, techniques and secrets into a neat package. Jonathan White has developed in his own research and testing of low-effort organic vegetable gardening in small spaces. The package is professionally produced, and the material is well presented and easy to follow. It is actually a training system to allow anyone to create a productive garden in as little as an 8' x 8' space. Jonathan explains how to build healthy soil, composting, starting seeds and caring for seedlings, watering and garden maintenance, and how to manage weeds and pests. Jonathan even explains how to follow his system if you don't have a yard, by using containers to grow crops. The Food4Wealth system is easy to follow; its a simple method explained in a straight-forward way that any person can easily start growing their own food and take control of their food quality, affordability and availability. 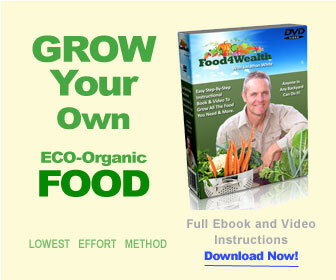 There's an 80-plus page e-book and 60 minutes of video included with the Food4Wealth system. And, even though I have been gardening professionally for many years, I picked up a few tips I can use in my own garden. His advice about plant spacing and companion planting is particularly insightful. From time to time I recommend books and software on this site that I believe will be of value to my readers. I only recommend products I actually own and use myself. And I only recommend the best I can find in that particular category of product. If you follow my recommendation and buy one of these products through the link on my site, I receive a small commission from the originator of the product. This is one way I create income to maintain and improve this site, and keep reviewing genuinely useful products. Hopefully, you will agree this is 'win-win-win' for you, me, and the people who create these great products.